Classic terra cotta flowerpots are practical but boring. Customize these inexpensive pots to create striking outdoor artwork. Whether you paint them, decorate them, use them to make sculptures or turn them into fountains, change them from functional to fabulous. Changing the color of your pot can make it a more decorative element in your garden. 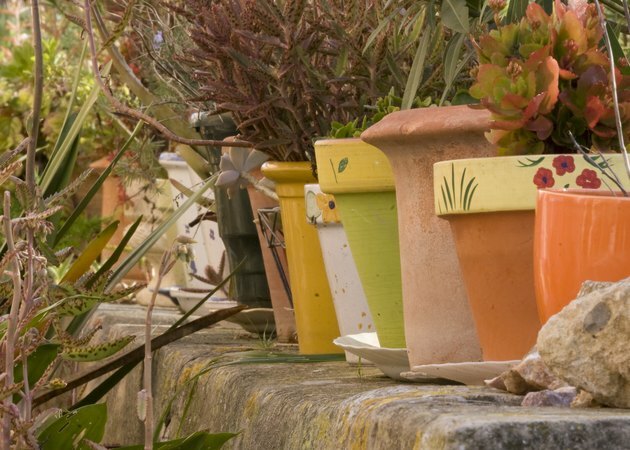 Colorful paint transforms terra cotta pots. For a traditional look, cover the entire pot in a bright color such as turquoise or yellow that will stand out among the plants. If you want more eye-catching look, create a pattern or design on the pots. Use painter's tape to create crisp lines for stripes. Trace bottle caps in varying sizes to give the pots a polka dot design. You can also buy stencils at the craft store in more intricate shapes such as stars, flowers or butterflies. For the best results, use acrylic craft paint on the pots. Foam brushes work well for applying a solid color, but a small artist's paint brush is better for detail work. Porous terracotta can soak up a lot of paint, so you may need to apply multiple coats to get the desired depth of color. When the pots have dried completely, apply a clear, water-based acrylic spray to seal the surface and protect the paint. If paint alone isn't enough to transform a terracotta pot into garden decor, add embellishments. The craft store has plenty of decorations such as glass gemstones that you can hot glue onto the pot for extra shimmer. You can also use decoupage glue to adhere paper or cardboard materials, such as vintage postcards or seed packets, to the pots. For a Mediterranean feel, consider using broken pieces of tile, china, glass or stone to add a mosaic pattern to the pots. Use a polymer-fortified thin-set mortar to adhere the mosaic pieces to the terracotta and allow it to dry overnight. Fill in the gaps with grout and allow it to cure for 48 hours. To ensure that the pot will last out in the elements, seal the surface with a tile and grout sealer. Garden gnomes and other statues add a whimsical look to a garden, but you don't buy one when you can make one. With a few terracotta pots, you can customize your own statues to peek out among the plants. Gather pots in various sizes to serve as different parts of the statue's form. Stack the pots on top of one another and use raffia thread to tie them together through the drainage holes in the bottoms. You can form arms and legs by stringing several of the smallest pots together and attaching them to the body. If you want the statue to stand, though, reinforce the raffia with wood glue. Create animal or insect statues such as pigs or caterpillars by stringing the pots together horizontally instead of vertically. Once you've got the pots attached, use paint, ribbon, beads and other decorations to embellish the statues. Create a serene, calming atmosphere in the garden by using terracotta pots to make a fountain with soothing running water. Use several pots in different sizes with the largest placed at the bottom to serve as the base. Fill in the base display pot's drainage hole with foam sealant or silicone caulk and run a length of flexible plastic tubing through the other display pots. Invert smaller pots inside display pots to serve as supports. Run the tube through those as well and connect it to a 375 gallon per hour pump. Place the pump in the base pot and use the foam sealant or silicone caulk to secure the tubes in the drainage holes of the support pots. At the end of the tube, install a water flow valve so you can adjust the flow. Set the pots inside of one another and add water to each until they're overflowing. Turn on the pump and adjust the valve.